Utilitaires are a great way for me to get out the door when I might be swayed to stay inside otherwise. This Saturday the winds were howling in the D.C. area, but I had a baby shower utilitaire to attend. I pedaled my way diligently to the shower, totally focused on my destination and blocking out the windy conditions with my mind. My reward was a lovely baby shower, a bit of exercise, and an awesome tailwind on my return trip. Thank you, utilitaire cycling! Chesapeake Sailor attended his son’s middle school basketball game (sporting event), and couldn’t help himself from prooving en route that he could pedal faster up a hill than a motor scooter. In more school activities, One Speed: GO! rode to a music concert. Because he chose to go by bike, he didn’t have to compete for parking. Nice! Biking in Heels went to the library to pick up a book for her friend, the Scientist. I learned about her library’s “speed read” section and I also like how she bungeed her book to the rack. As a utilitaire substitution, An Old Guy on Two Wheels pedaled over the the county tax assessor to pay something that, ironically, had to do with his car. Later in the week, he went out for breakfast tacos and a cup of coffee. The tacos sound delicious! @katychancy utilitaired and has a new French press to show for her efforts. What’s this? Lynne’s bike is actually locked outside on this breakfast utilitaire! BikesNCoffee went out for coffee. How fitting! He also did some other things along the way, calling the full trip coffeelunchanneuring, and noted that the cold weather really makes his sinuses go. Yes, that’s true. @tangobiker took a page out of Lynne F.’s book and rolled his bike right into the “bottle shop,” rather than lock it outside. Later he attended US Representative Suzanne Bonamici’s town hall meeting. Berlin by Bike went to a cool museum, the Berlin Unterwelten. She also added a coffeeneuring trip to a place where they served Ritual and Stumptown coffee. How is it Berlin by Bike can find a place in Germany that serves San Francisco coffee, but I can’t find the tasty Ritual beans in Washington, D.C.? At least we have Stumptown. @sognrider pedaled the Rawland to the grocery store. Who makes those panniers? @rebalancedlife went to the grocery store, too. Will there be a blog post? 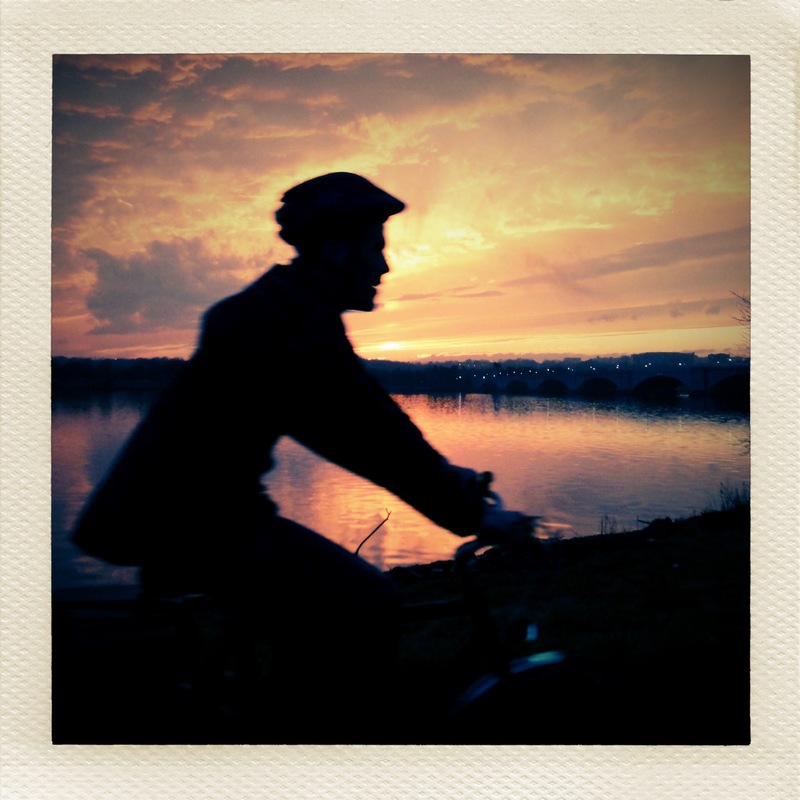 shebicycles beautifully documented her ride to her volunteer job with the American Red Cross. I was sorry to read about the reduction in staff at their local chapter. shebicycles wrote several posts about the incredible damage from the previous season’s tornadoes and the involvement of the American Red Cross. On a lighter note, she coffeeneured, too. Great behind-the-bars shot! JDAntos multi-modal-utilitaired by using his bike to assist him in dropping off his car. Port-a-John has been logging some longer miles on the road, including a recent solo century known as the “Weenie One Hundred.” He rewarded himself for his efforts with a utilitaire to a hot dog place, ha ha! Bicycle Bug pedaled himself to the library for a history workshop so that he could learn more about the area where he lives. I didn’t even know groups offered workshops like this. Like! And finally, our man Rootchopper over at A Few Spokes Shy of a Wheel. What can I say except… Whoops. Good thing he was riding on steel. That’s all I’ve got. Know something I don’t? Please add it to the comments! Thanks to everybody who’s participating, writing, tweeting, and blogging their adventures. I heart utilitairing! Dang! Now I have a lot more blogs to follow. In about an hour, I’ll be riding to the hospital to have the staples (from my accident last week) removed from my scalp!